Home Tags Posts tagged with "rubber flap"
Some of us wonder what happens to the luggage once it has been handed over at the check-in desk and disappears through the rubber flaps. The mystery has been cleared up after Delta Airlines added hidden cameras to a suitcase to see exactly what happens behind the scenes. Delta Air Lines fitted six high-quality cameras inside the case and cut holes in the material so that the camera lenses could see out. The cameras record the time before departure, every moment on the two hour flight from Atlanta to New York, and the bag going into the arrivals lounge. The promotional footage for Delta Mobile Baggage Tracking App was uploaded to YouTube on December 22 and within days had already been viewed by more than 135,000 people. However, users were quick to point out that the video does not show any of the bad things happening to the luggage such as damage, missing items and lost cases. The video begins with the bag going from the check-in desk through the rubber flaps and along a conveyor belt. A winding journey through more channels of conveyor belts takes the suitcase into a large warehouse where it is scanned. “TSA scan area. No photography allowed,” appears on screen to explain why x-rays and manual checks for drugs, weapons and explosives are not seen. The luggage then resumes its journey through the warehouse before it is collected by workers in fluorescent jackets. They then toss the luggage onto a wagon which taxis it to a plane where it is packed into the storage unit. Two hours later the baggage emerges unscathed and after a short journey pops through the rubber flap and onto the conveyor belt where travelers wait anxiously to spot their cases. “So finally I know how many hands touch my bags,” one user wrote online. One user pointed how smooth the journey was. 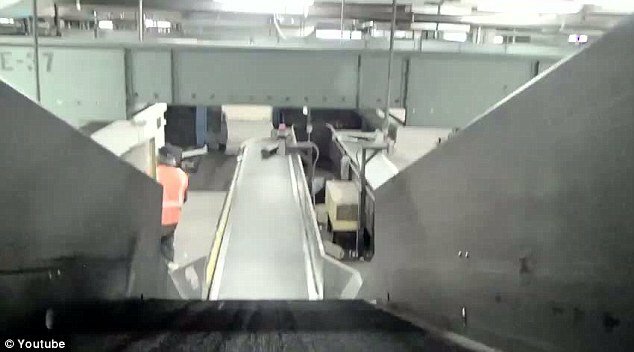 “I wonder what would have happened if the baggage handlers didn’t know they were being filmed,” he said.